The arrival of a new Alexander Payne movie, after the filmmaker experienced awards success with the likes of Sideways, The Descendants and Nebraska, should have been a cause for celebration and high anticipation, especially when he was taking on a very ambitious idea that he had been toying around with for years. Sadly, in this instance, it turned out to be something of a misfire; critics were divided by it, audiences didn’t warm at all to it, and it became a box office bomb in the States after taking in only $23 million against a $68 million budget. Even when I first reviewed it back in October during the London Film Festival, I could tell it was going to be a divisive film for many, and lo and behold my prophecy came true. But now that a bit of time has passed, was this just a matter of Downsizing being a bit ahead of its time? Is it a lot smarter than we first gave it credit for, and is it going to stand the test of time with a compelling story, though-provoking characters, and a dynamic commentary that really says a lot about society as we perceive it? Nope; it’s still as confounding a misfire as it was back in October, and a major disappointment for anyone expecting Payne and his crew to take full advantage of such an interesting set-up. The story, in case you need reminding, sees the world transformed by a revelatory new procedure that shrinks people down to five inches, in a bid to halt the growing environmental and overpopulation crises. One financially-strapped couple, Paul (Matt Damon) and Audrey (Kristen Wiig), decide to have themselves shrunken down and, since their assets will somehow increase once they are small, opt for a new luxurious lifestyle in a giant mansion. However, right after Paul undergoes the procedure, he learns that Audrey balked at the last minute, leaving him alone in his new miniature paradise. From there, it almost becomes a completely different film, the details of which I’ll refrain from discussing due to spoilers, but it most certainly does not feel like it naturally follows everything that came before. I talked about this in the previous review, but it’s almost as if the entire shrinking plot becomes completely arbitrary to everything else, like you could easily remove that aspect from it and nearly nothing would be changed. Instead, Payne opts for something that was probably meant to be more human and grounded, but when you set up a world where this kind of science is possible, it’s hard not to feel a bit let down when it decides not to focus on any of that, but instead on the life of the dull main character that Damon plays. As strong a screen presence as Damon can be, he’s been given a very bland part to play that he can’t make interesting in the slightest despite his efforts, and the fact that this is not only our main character but we’re expected to develop an emotional connection with this guy as the movie goes along, just makes it a bit more tricky for the audience to really engage with this movie, because there also doesn’t seem to be much else of interest happening around him. Damon and the plot this second half decides to inflict upon is entirely overshadowed by our burning desire to see more of this procedure and how it works, which is something that we’re exposed to very little of, to the movie’s detriment. Instead, Payne takes more time setting up a very debateable addition to the cast of characters, one who’s become the sole aspect that everyone can agree as being the best part of the movie, but at the same time stir up conversation about whether it’s a racially insensitive role or not. I am, of course, talking about Hong Chau as a one-legged Vietnamese protestor-turned-cleaner, who becomes a central figure in this latter half of the movie, and again it’s a part of the movie I brought up before, but this time I have a bit more to say about it. While there’s no doubt that Chau is really great in the part, the way that it’s written and directed is questionable to say the least. She speaks with a heavy high-pitched Vietnamese accent, mostly in broken English which is clearly for laughs since the audience I saw this with were laughing heavily at every one of her mispronunciations; it’s a little uncomfortable, because it feels like I’m watching a racial stereotype from a WW2-era Bugs Bunny cartoon, although I know for a fact that this probably wasn’t meant to be the case, because otherwise why would the actress even agree to do the role? It’s probably just a bit of misguided direction on Payne’s part, because it is an interesting character, and once again Chau absolutely shines in the part, but the way it’s brought to life is just a bit too questionable for my tastes. 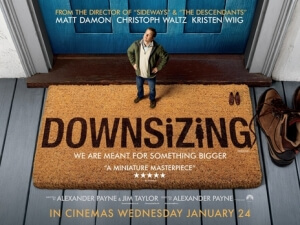 Overall, two viewings of Downsizing are more than enough for my eyes, because there’s nothing about it that really springs to life, especially in that meandering second half, that warrants even a second viewing of the damn thing. It’s by far Payne’s weakest film, which is a shame because it is definitely his most ambitious; perhaps if he put a little more of that into making a coherent story, filling it with a more compelling lead character that isn’t overshadowed by others, and not appearing to resort to bringing out a possible Asian racial stereotype just for laughs, then it could have been far more than the disappointing mess it turned out to be. Downsizing is still just as confounding a misfire as it was from back in October, with a second half that takes very little opportunity of the scientific set-up it moulds itself around in the first half, a bland lead character that not even Matt Damon can bring to life, and a bit of misguided direction that makes one stand-out character look like a racial stereotype when it so clearly wasn’t meant to be that in the slightest.